A New steel shield blank was donated to the Kingdom in AS 49 in order to create a combat-ready Shield of Chivalry by Duke Andreas der Eisfalke. 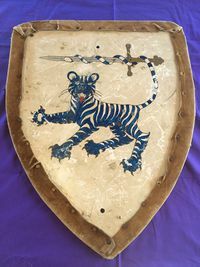 Baron Simon Gwyn, the holder of the shield of Chivalry in the winter of AS 50, painted the new Shield to match the old. It was unveiled to the populace upon his elevation to the Order of Chivalry at the 12th Night celebration in AS 50. It was first used in combat at the Market Day at Birka where the fighters of the East were invited to scuff up the new shield to match the old. 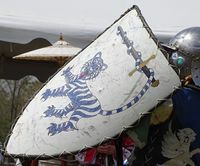 -The Shield in use by Sir Simon at Gulf Wars XXV. This page was last edited on 8 April 2019, at 16:23.